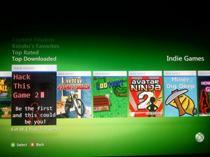 Indie games are getting a little bit of love on the 360. Not a crazy amount of love, but it's a start. The Indie Game Marketplace isn't the first place people go when looking for games on the Xbox 360. In fact, for many it's the last. For others, it's a part of Xbox Live they've never even visited - it's not exactly a featured part of the dashboard. The games aren't always the most compelling, they're not always priced appropriately and they tend to be limited in scope. Thankfully, things are changing for the better for the indie community, at least in terms of creating and pricing games. For starters, Microsoft has raised the maximum size of an indie game from 150MB to 500MB. That's a significant step up and should allow indie developers a lot more freedom in creation of their titles. Pricing requirements for indie titles has also changed. It used to be that any game over 50MB was required to cost either 240 or 400 MS Points. Now games as large as 150MB can be priced at 80 points - just $1.00. Finally, developers are now allowed to have up to 20 games on the marketplace at a time. That's a nice feature in some cases, but it sure doesn't help to clear up the clutter on the Indie Game Marketplace.